That Srinu Vaitla is one of the most successful writer-directors in Telugu Cinema of late is a fact known to anyone & everyone who knows a bit about the industry. And most people also know that he is indeed a master when it comes to making formula masala films, all within a particular template that he’s gone on to perfect pretty well in film after film. Personally I admit to having enjoyed most of his films, despite their predictable pattern. In 2011 Srinu Vaitla and Mahesh Babu created box office history by coming together for Dookudu, a film which milked all the possible commercial ingredients to emerge a winner. So post Baadshah when Aagadu (One who will not stop) was announced by Srinu Vaitla with Mahesh Babu in the lead, expectations naturally were quite high, considering the success of their previous film. Aagadu incidentally is also produced by the same producers of Dookudu- Ram Achanta, Gopichand Achanta and Anil Sunkara of 14 Reels Entertainment (incidentally they also produced Mahesh Babu’s recent film, 1 Nenokkadine). Aagadu also sees many others from the Dookudu team featuring again, including DOP K.V.Guhan, editor M.R.Varma and a whole host of actors including Sonu Sood, Brahmanandam , Nassar and M.S.Narayana. The teaser and trailer forecast a mix of Dookudu and Gabbar Singh and thus I was eagerly waiting to watch the film on the first day of release, hoping that it would be a relatively fun outing in many ways. So I did set out to watch the film as planned, with a friend in tow who was quite blown out by all the fans of Mahesh Babu going berserk in the single screen (Aurora Cinema) where we were watching the film. As the movie began I was wondering if the film would be at least as good as Dookudu if not better, hoping it would not be as dry as Srinu Vaitla’s last release Baadshah, and if this would be a far better outing for Mahesh Babu compared to his earlier release in the year (1 Nenokkadine). Shankar (Mahesh Babu) is an orphan who is given a home and family by a good cop (Rajendra Prasad). But circumstances force him to leave home and his family and Shankar ends up becoming a cop on his own. Shankar is now “Encounter”Shankar, a much revered Circle Inspector who gets transferred to a small town Bukkapatnam which is under the control of Damodar (Sonu Sood), the local don who runs a complete illegal empire over there. Damodar’s focus of attention is an upcoming power plant, which Shankar is opposed to. What happens in the tussle between Shankar and Damodar is what the rest of the film is all about. No prizes for guessing which direction the tide will flow and what all to expect from this routine tale that has been dished out to us by Srinu Vaitla. The film has all the usual tropes that one can expect from his films and here’s a brief look at those elements as well. 1. The hero can simply do no wrong-Mahesh Babu as Encounter Shankar is the perfect cop that the department and the people around him are in awe of. He is so good that why just the heroine, slowly his detractors also indirectly admit their admiration towards him. 2. The film has to have a pretty heroine whose only role is to provide the romantic angle to the hero and of course appear in dream songs. And Tamannaah is more than adequately cast for the same, no doubts at all. 3. There has to be a large family living in a palatial house and they will obviously play their part in an interesting game/skit designed by the hero. Here the family in question is Saroja (Tamannaah)’s family but the only difference here is that their involvement in the main plot is way too limited. 4. There has to be a major emphasis on comedy with the comedy track sewed into the main plot right? Of course here you do have the usual suspects Brahmanandam and M.S.Narayana doing just the same. But before they make their entry Srinu Vaitla also tells us that there are others performing the same including the likes of Raghu Babu and Posani Murali Krishna. But it is sad to see a veteran actor like Nassar resorting to buffoonery in the name of comedy, seriously. 5. And of course if you are wondering if Mahesh Babu ends up making a ‘bakra’ of Brahmanandam as part of the comedy drama, then yes you are absolutely right :). While M.S.Narayana and Brahmanandam do bring in some chuckles, the film doesn’t give them much scope. While the former has a reduced appearance in the film, with the latter it is a case of “been there, seen that” which reduces the impact. I mean for people following Brahmanandam’s work closely seeing him dance to popular hits isn’t a novel thing anymore. 6. Punch dialogues-the film has to have loads of it right? Yes and Aagadu indeed has loads of it and everyone right from a petty villain to actors like Brahmaji revel in it. Mahesh Babu tries to sound cool by playing down the whole thing by even saying “oops, looks like even I’ve uttered a movie style punch dialogue”. 7. There has to be a back story to the hero’s mission and there exists one here as well. Thankfully the flashback portions are kept to the brief and do not really consume too much of the film’s run time. 8. Talking of the run time again a trademark element in films like these is the rather luxurious run time of 150 minutes and more, a feature seen in most Srinu Vaitla films. 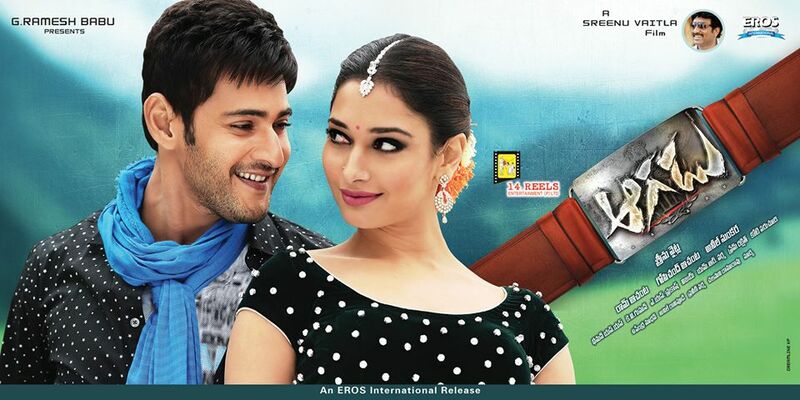 Aagadu too scores in the same fashion with a run time of 165 minutes. But while in case of films like Dhee, Ready, Dookudu etc the gags are able to keep us hooked to the film for most part, here unfortunately it doesn’t happen and the film does wander aimlessly in between. 9. Having an item number involving a popular actress is also needed right? So why just anyone when we can get Shruti Haasan for the “Junction Lo” song for which she not only has performed on screen but also provided the vocals as well (along with Simha). 10. The film also needs to have some standout gags & the Potugadu game show sequence here is the highlight. The Saroja Sweets T.V ads also manage to create an impact of sorts. But eventually Aagadu is just an attempt at recycling whatever Srinu Vaitla has done in the past and most of the cast and crew members also seem to have done their part in similar fashion. Take Thaman’s music for example. This is just another standard album from him which he seems to “create” and generate with factory like precision, time and again. While songs like “Bhelpuri” (lyrics by Bhaskarabhatla and sung by Sooraj Santhosh and M.M.Manasi) and “Aaja Saroja” (lyrics by Bhaskarabhatla and sung by Rahul Nambiar) might generate some interest while you watch the film, it’s highly unlikely that you may remember them once the next Mahesh Babu film is out :). K.V.Guhan’s cinematography is of the routine work but he makes the songs do justice to the interesting locations chosen. Another problem with the film is that it is a little too verbose at places. Take for instance Mahesh Babu’s unique style of “lecturing” to the villains one by one and then pinning them down later. What looks imaginative initially soon loses its charm as it is tried out again and again. Talking of performances, Rajendra Prasad in a cameo lends a dignified presence to the movie. Tanikella Bharani, Raghubabu, Posani Murali Krishna, Ajay, Vennela Kishore, Bhramaji etc put in standard appearances in the film.. Ashish Vidyarthi has a standard role here but his gay angle stood out like a sore thumb & once again it made me wonder why filmmakers need to portray gays in such a bad fashion in commercial cinema. Sonu Sood continues from where he left off from Dookudu and is fair to the role of the main antagonist. M.S.Narayana as mentioned earlier does not get much scope here but is funny nevertheless. Brahmanandam’s portions look repetitive but he still has the knack to make us laugh despite all that, like only he can. Tamannaah plays the pretty babe as needed in the script and does not really have anything else to do apart from the regular song appearances in which she does look lovely though. Ultimately Aagadu is all about Mahesh Babu and despite playing a cop again he makes sure that he sports a different dialogue delivery style and mannerism when compared to his role in Dookudu. He even manages to pull off a signature dance step or two while performing to the songs, thus pleasing his fans all the more. If I were to go back to the questions I had in my mind before watching the film then I must admit that Aagadu certainly isn’t as much fun as Dookudu was but it is a little more engaging than Baadshah. It is also not an indulgent film like 1 Nenokkadine but then it’s also not the best of Srinu Vaitla, far from it in fact. The film has its moments but ultimately what holds the film together and makes it watchable to an extent is the presence of Mahesh Babu who is charismatic as always. It’s a pity that Srinu Vaitla couldn’t have utilized his resources in a much better fashion, for Aagadu will always be remembered as a missed opportunity in a way.